More and more people are understanding that well-being encompasses body, mind and spirit, and as a result, are turning to complementary therapies such as Reiki to improve and enhance their quality of life. And, as we are experiencing the benefits of Reiki and other alternative therapies for ourselves, we also look for alternative ways of caring for our pets. They, too, will benefit from these modalities. Illness and even the normal aging process can manifest in signs of pain and reduced energy in pets as well as in humans. Your personal stress can be reflected in your pets and create illness for them. Conventional medical treatments often cause side effects that can be alleviated by alternative therapies. Reiki is an energy therapy that can bring relaxation, comfort, more energy, healing and an increased sense of well-being to pets and their people. 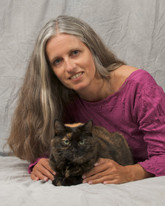 Healing Hands provides Reiki for pets and people along with providing you the information you need to feel comfortable and confident about these therapies. Reiki, massage and other alternative therapies are not a substitute for veterinary care. This website is best viewed with a cat or dog in your lap.